But, says Welch, "He and I were using this as an opportunity, the four of us, to focus on the question, rather than assess blame." To that end, the delegation was briefed in Tripoli on what Welch characterized as "substantial" security improvements to American embassies in the region. Those include higher walls of reinforced concrete, increased perimeter surveillance and new "safe retreat buildings," where embassy personnel can hunker down during an attack. While necessary, Welch says, those security improvements raise questions about how effectively American officials can engage with local populations. "We have to protect our diplomats and their families," he says. "The question I think our country — our State Department and our Congress — has to address is how to get a balance between measures that do provide for the safety of our diplomats on the one hand, but on the other, are not so overly restrictive that they actually impede the ability of our diplomats to do their job. Getting that balance right is an ongoing and difficult process." If a region grows "so dangerous that people shouldn't be there," Welch says, it may make more sense to withdraw American personnel than to "build an impregnable fortress." In 2011, Welch endorsed President Obama's decision to participate in multinational air-strikes against Col. Moammar Gadhafi's regime. More than two years later, he says, the political and security situation in Libya remains "very fluid." After 42 years of living under "egocentric, megalomaniacal, individualized rule," Libyans are struggling to create stable political institutions. "The expectation that Libyans could go from overthrowing Gadhafi to being Athens is obviously wildly overblown," he says. "So what can we do? What we can do is be helpful and supportive. But I think we have to be modest and understanding that this fundamentally is a challenge for Libyans to try to bring stability to their country and build institutions." After leaving Libya, Welch and his colleagues traveled to Cairo, where they were briefed by the interim U.S. ambassador to Egypt, David Satterfield. They then visited multi-national peace-keeping troops at a base in the southern Sinai Pennisula. Those troops, which include 500 American soldiers, are charged with supporting the 1979 peace treaty between Egypt and Israel and monitoring the border shared by the two countries. "For me, it was a wonderful experience because I was visiting American troops who were involved in peace-keeping, whereas most of the troops I've been visiting in Iraq and Afghanistan, of course, have been in combat situations — in dire life and death situations," he said. "This is an example of a multinational force mission that has been very successful in maintaining the provisions of the Egyptian-Israeli peace agreement." While some in Congress have questioned whether the U.S. should continue to fund such peace-keeping missions, Welch said his visit convinced him it's money well spent. "I think this is a very small investment for a very big peace dividend. And it's been effective," he says. "The nature of it being with 13 other countries sharing the burden, both in terms of money and forces, is a good thing. I would support continuing the work of the multinational force of observers in the Sinai." In Cairo, Welch says he focused his attention on the demographic challenges of a country whose population is growing far faster than its economy. He also discussed America's evolving response to the Egyptian military's removal from office and jailing of then-president Mohamed Morsi. While the U.S. has not formally designated the overthrow a "coup," it has suspended some military aid to Egypt. For his part, Welch says he continues to believe it was a coup. "But what's different about it is it had a lot of popular support. It's not a Gadhafi-style coup where one powerful military person uses violence to take over and become a dictator with no popular support and imposes his control," he says. "But it was a coup. The test in Egypt right now is will there be democratic elections and what will be [the military's] role in the Egyptian economy?" Welch would not say whether Morsi should be released from prison, but he did say that the military must "restore the rule of law in Egypt, and the rule of law would suggest that, first of all, you don't have coups." In the long run, Welch says, Egypt remains "quite important" to U.S. foreign policy, but Americans must have "more realistic expectations" about the extent to which the U.S. can influence the nation's domestic policy. 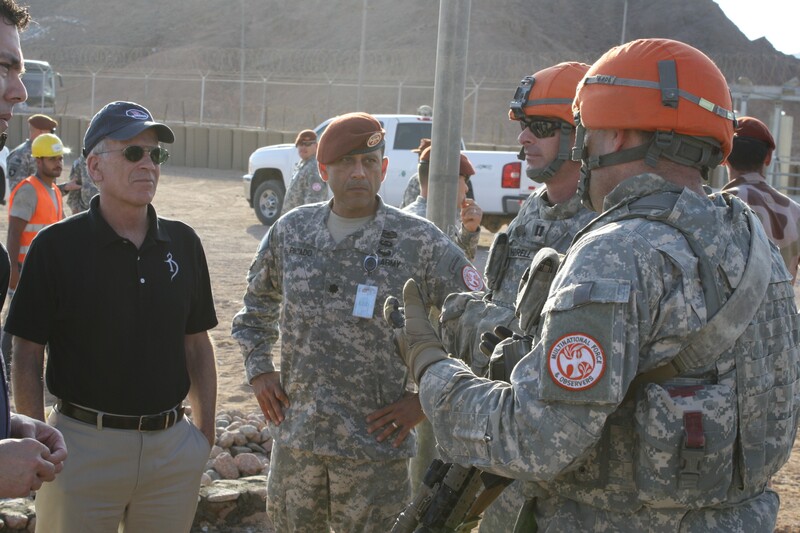 Photo of Welch with U.S. peace-keeping troops in the Sinai courtesy of Welch's office.